The video says it all: . 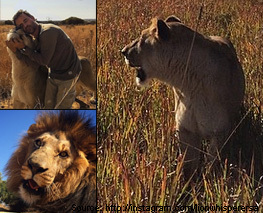 A man on a mission to save the lions Kevin Richardson (Lion Whisperer) has this amazing repoire with lions. This wildlife conservationist commonly seen cuddling with lions, and seemly accepted into their family pride. His wildlife sanctuary is situated on the Welgedacht Game Reserve 90km from OR Tambo Airport, North of Pretoria. Where day tours are run by Welgedacht Safaris. The Professional guides set off for Kevin Richardson Wildlife Sanctuary where you can see Lions, Hyenas and black Leopards that reside there. After your visit there is a game drive on the Reserve (being part of the greater Dinokeng Big 5 Reserve) where you can see the big 5 as well as a multitude of other game and wild life in this secluded and serene reserve. It’s a Safari in a day experience from 08:00 to 16:00 with snacks, refreshments and when you get back to the camp, a South African boma lunch. Call CABS Car Hire for a car and we will point you in the right direction for one of the best days of your life.